River Ranch Lodge & RestaurantWild Winter Wednesdays: Final Round! Wild Winter Wednesdays: Final Round! Join us for our FINAL Wild Winter Wednesday of the season! Terrific raffle prizes donated each week by the community, including Tahoe Dave's Skis & Boards, Sunnyside Restaurant and Lodge, Mountain Valley Meats, Bar of America, Ski Butlers, Granlibakken Tahoe, Pablo's Gallery And Frame Shop, Viva Treats, North Lake Tahoe Resort Association I Chamber of Commerce I CVB, All Fired Up! Tahoe, Trilogy Spa Squaw Valley. Sugar Pine Cakery & Cafe, and many more! 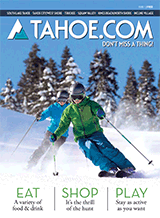 All proceeds benefit Humane Society of Truckee-Tahoe!